The Jury Duty of DOOM!!! I had to serve on jury duty, and it totally sucked. Aside from having amazing lunch two days and a good breakfast sandwich one day, I can’t say I got anything positive out of jury service. Not only do I have to live with the fact that I had to decide in favor of people who were clearly guilty but got away with it because the prosecution didn’t bring the right proof, I had to sit for a week in the most boring courtroom ever imagined. It was bad. The lawyers kept asking the same questions, and they kept playing the same boring thirty minute videos of people walking down a hall. Seriously, one day, I’m going to take a panel of judges, lawyers, and criminals, sit them down in uncomfortable chairs for 8 hours, and make them watch me add liquids to flasks for 8 hours a day. 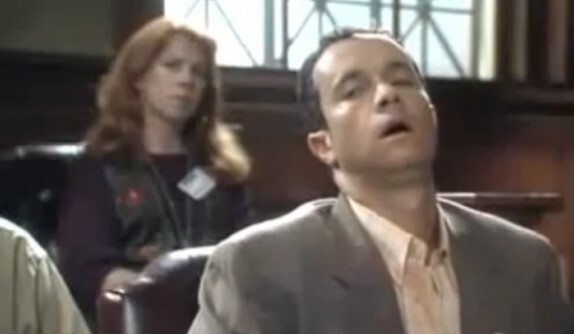 There was one juror that really got under my skin. She had something to say about everything. If I went to the fridge and picked up a diet Coke, she made a comment about how she doesn’t drink soda. When I didn’t try one of her disgusting smelling blueberry muffins that she proudly made from a box, she made a comment about how I was the only one who didn’t try one. One day, we were in the juror box in the courtroom being bored, and my nose started bleeding. Seriously. I was just sitting there, and it happened. So I motioned to the clerk who called for the judge to give us a recess, and she asked me how she could help me. I asked if there were any tissues, and the annoying woman stuck her hands in my face with handfuls of bunched up used napkins from her purse. They ordered us lunch on the first day of deliberation. They gave us a menu from an Italian place, and assured us that the food would be delivered hot if we ordered hot food (95% of the menu was hot stuff). We found out the food arrived at 11:30am, and we weren’t excused for lunch until 12:20pm. Yum, room temperature chicken parm! Someone commented about how they couldn’t eat their wings because they were cold, and the annoying woman picked up the aluminum tray out of their hands and started walking over to the microwave. About 3 of the other jurors jumped in front of her to stop her from doing something really stupid with someone’s food she had no business touching. Also, on the first day of juror deliberation, we were there past 5pm, and the air conditioning seemed to stop around 4:30PM. It was hot and stuffy. We had to write a note to the judge to ask to be excused, and they had the nerve to ask whether we thought we could come to a verdict later that evening. They let us go for the night, but basically told us they weren’t buying us lunch on Friday. So it’s hard for me to focus on the good of the jury service, especially since I still feel horrible about the verdict. The one good thing: I was already downtown to pick up my Cheesecake Machismo birthday cake. Yes, I had the jury duty of DOOM on my birthday, too. WHAMMY! Get this: apparently it’s not uncommon for people to *volunteer* for jury duty! Email this post to John Diamond. He is the commissioner and, I am sure, would be curious to hear your feedback.